Many experts believe the global food shortage will become the greatest crisis in American history. How To Prepare For An Unthinkable Crisis! There now exists a new video course that reveals how to safely prepare and store foods in the event of a dangerous worldwide crisis. It’s designed for anyone who is frustrated with surging grocery prices and the very real possibility of empty shelves during the latter half of the Obama administration. The success of the new videos has already encouraged hundreds of people who never thought they could preserve their own food to take action and finally start storing their emergency supply. Easy To Watch And Easy To Learn! There is still time for you to prepare, but you have to start learning how to make your own survival foods as soon as humanly possible. The best way to do it is to get the inside scoop on how to do it right. 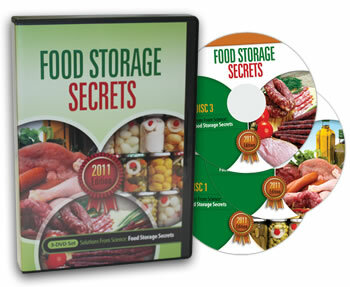 Fortunately, there is a way to get twenty years worth of food storage secrets crammed into two DVD's. This new food storage system is called Food Storage Secrets. 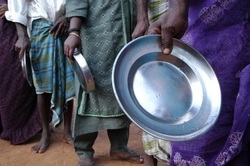 You do not need a lot of expensive equipment to store foods for a crisis using the methods taught here. Even better, Food Storage Secrets pays for itself quickly as you begin to put away garden produce or even meats that you buy on sale. For most folks it's simply the biggest bargain of their lives. You can finally become self-sufficient and any extra money saved in food expense goes right back to your pocket. Best ways to keep food fresh for a year at a time. Secrets to keeping your kitchen safe. When to say “no” to canning fruits and vegetables. Utensil shortcuts that can save a fortune. How to produce the absolute best tasting survival food. 4 important steps to insure your food is ready to be processed. The absolute best method to can tomatoes. One deadly mistake beginning canners make and how to avoid it. Canning times and pressure tables for 39 different meats. Canning times and pressure tables for 21 different fruits. Altitude charts you can’t can without. The only safe way to can meats. How to get more vitamins, minerals and trace elements into your canned food. Frankly, at the end of the day, Food Storage Secrets actually makes you money! Click the link below for more information. Get this Free 63 page ebook with your DVD order. This robust guide is packed with all kinds of valuable information, including quick-reference charts, full-color diagrams, and even tasty recipes. You'll discover the exact tools you'll need to start canning; step-by-step instructions for canning different types of foods; processing times for fruits, vegetables, and meats; how to keep jars from breaking; common canning problems and solutions; how to "put up" food at high altitudes; and much, much more! This supplemental guide is the perfect companion for your Food Shortage Secrets DVDs. And it's yours FREE when you order today! This might be our last season to learn what to do before a crisis. 2-set DVD $39.95 plus $5.00 shipping. Includes FREE 63 page ebook, "Food Storage Secrets"